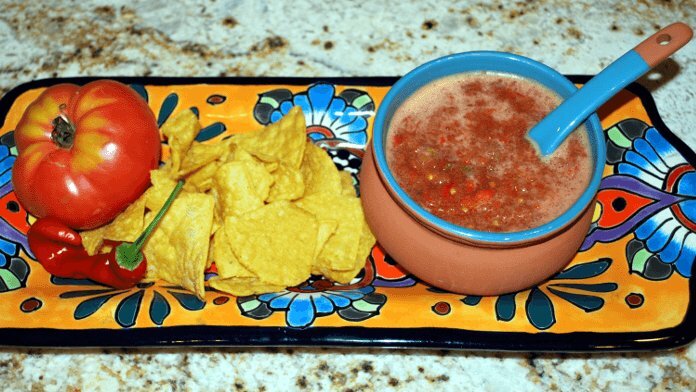 Homemade salsa (tomato, onion, chili peppers) is easy to make and always delicious. Core and halve tomatoes. Chop onion. Remove seeds and tops of peppers. Transfer all ingredients to your blender. Blend to desired consistency (15-20 seconds in our Vitamix blender). Pour into serving dish. Add salt and lime juice to taste. Notes: We've found that red onions have more flavor than white, so if you use a red onion (recommended), start with less and add more to taste. You can also add chopped cilantro at the end, if that's to your liking.